Every scleroderma patient presents with differing symptoms. No two patients present with the exact same identical set of symptoms. 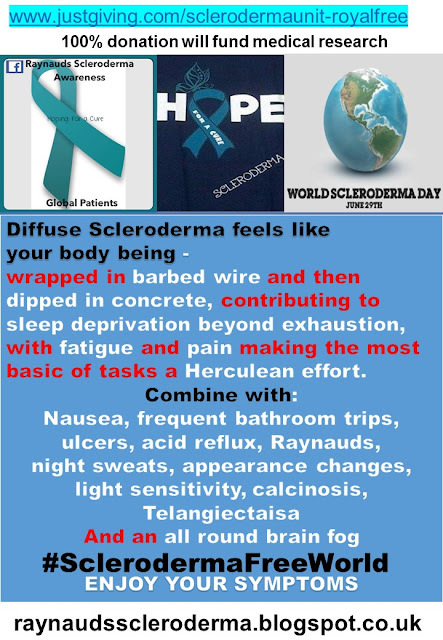 Diffuse / systemic scleroderma affects the entire body, making for a multi-disciplinary medical team paramount, for best patient optimum care. Attending and preparing for medical appointments, is a full time job, even when the symptoms have stabalised. 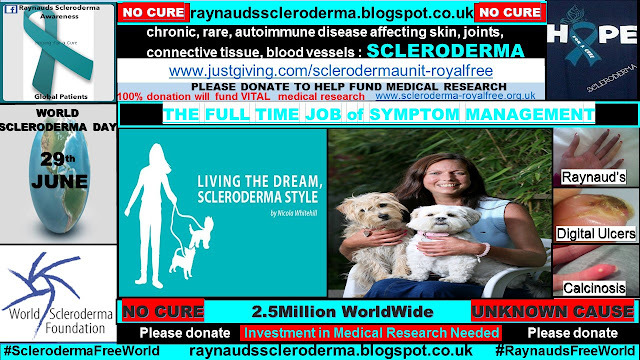 Not only does a scleroderma diagnosis bring a change in the body’s capacity to function, but also, a drastic change in lifestyle, by way of no longer being physically able to participate in tasks and hobbies which were once, a source of joy and remuneration. On a personal level, there is not a day which goes by where I do not think of my ‘old life’ as a practising barrister, appearing at various crown and county courts, representing and advising clients. However, being realistic, I must respect my symptoms, in an attempt to minimise their severity. On Dec 8th 2016, I was live on the Scleroderma News facebook page, talking about my recent skin reversal, as well as, I shared some of my scleroderma survival tips. This was my live debut, and although my phone signal brought about an earlier finish than planned, I very much enjoyed the experience, and I was delighted with the fantastic audience who joined me live – Thank You. Having been a scleroderma patient for 19 years now, it is my view, further to my own personal experience, combined with my observations of the global scleroderma community, that, Scleroderma turns ‘social butterflies’ and the ‘life and soul of parties’ into shadows of their former, older self. This is not just exclusive to scleroderma, this is a reality of the chronic illness patient and any patient, whether it be flu or any other transitory ailment, whilst the body recovers. Sadly, for some scleroderma patients, the disease process is too aggressive for their body to recover from irreversible damage which then becomes life threatening. On October 31st 2016, the UK Government published an open consultation on ‘Work, health and disability green paper: improving lives’. A ‘green paper’ is a preliminary report of government proposals that is published in order to provoke discussion. path a person is able to take in life – or in the workplace. and their determination and aspiration to succeed’. This runs until 17th February 2017. I would urge every UK patient and non-patient alike, to add their view to this consultation. For most scleroderma patients, the physical disability aspect of their diagnosis is one of many challenges which their daily reality poses. The hidden, sometimes invisible, challenges include chronic fatigue and pain. Both, can not be underestimated with the devastation that they can bring, alone or combined, on a day to day basis, to the scleroderma patient. Since it is the holiday time season, I would like to take this opportunity to wish you and your family a very happy festive time, feeling good. Unfortunately, the full time job of being a scleroderma patient does not allow for annual leave or a ‘holiday’ from the symptoms, yet. Investment in medical research combined with patient interaction by way of spreading awareness and involvement is key for a permanent scleroderma holiday of the future. 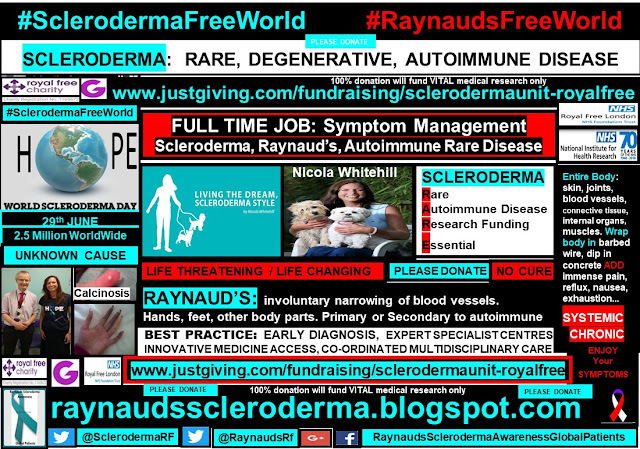 My Christmas wish is that 2017 will bring about the reality of #SclerodermaFreeWorld #RaynaudsFreeWorld.